I’m flying straight toward a hillside at 75 miles per hour. As I squint at the overgrown shrubbery in front of me, I can make out myself standing alongside Jim Carroll and Mark Rochefort. I go flying over my head and up the lift line at Bolton Valley Ski Area, and then zip back down along the trail. After another pass, the ground rushes up, and everything goes black. The eerie feeling of flying or hovering above oneself is usually the abstract stuff of dreams, but a few Vermonters get their thrills doing just that — with drones. These “drones” are really just high-tech remote-control (RC) planes. They’re launched by hand and controlled with what looks like an industrial-strength video-game controller. The cool part: Instead of squinting into the sun and trying to figure out where their plane is, members of this small but growing FPV (first-person view) community wear video goggles linked to a camera mounted on the front of the plane, so they see what it sees, hundreds of feet in the air and sometimes miles away from where the pilot is standing. Carroll and Rochefort are able to send their Ritewing Zephyr II models over vast swaths of the Green Mountain State, recording high-definition videos of scenic areas such as Camel’s Hump and Lake Elmore. Afterward, they set the FPV videos to music and post them online, joining an international community of thousands of hobbyists who are doing the same. To hear them talk about it, though, you wouldn’t think Carroll and Rochefort were standing on a hillside creating art. The lingo they share is more like that of a college engineering class: glide ratios, quads, milliamps, pepperboxes, immersion transmitters and spectrum analyzers. But these two aren’t electrical engineers or professional hardware manufacturers. Rochefort, 40, is the owner of Vermont Tire & Service; Carroll, 44, is a software developer. Their only qualifications are having some spare time and money, tolerant wives, and an almost monk-like acceptance of disappointment. “Being into RC is learning to live with loss,” Rochefort says. That’s because, for all their high-tech gadgetry, these planes are still just long pieces of Styrofoam with an attached motor. A strong gust of wind, radio interference or pilot error can lead to a crash, and that can be costly. 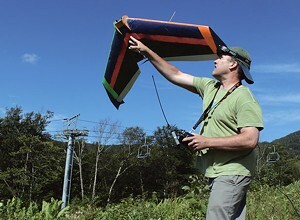 On each of their planes’ foam wings, Carroll and Rochefort have wired in two cameras — one to broadcast back to their goggles and a GoPro, the HD camera mounted on the front of the plane to get unobstructed video — at least two antennae, an electric propeller and some hefty batteries that help the planes reach speeds approaching 100 miles an hour. The technology that enables the small plane to fly runs $1000 to $1500, depending on which optional components are installed; Rochefort put a GPS autopilot system on his Zephyr so it will fly itself back to him if his controls fail. On the ground, tripod-mounted systems that communicate with the plane add up to about $1000 more. With four-figure price tags, these personal setups aren’t for penny-pinchers. Carroll and Rochefort say they don’t know of anyone else in Vermont who has a similar model, though there are a few more FPVers in the state using smaller planes. These drones are a far cry from their brethren flying over America’s war zones. Still, privacy concerns have at least one Vermont politician working to regulate their commercial use. Congressman Peter Welch announced a plan last month to introduce legislation that would require businesses using drones over U.S. soil to report to the Federal Aviation Administration exactly what data they’d be collecting, how they would use the information, who they would share it with and how long they’d keep it. Welch’s proposal moved Carroll to write to the Vermont representative. “He’s got some important privacy concerns,” Carroll writes in an email to Seven Days. But the hobbyist worries that potential new legislation could make FPV flights more difficult or prohibit them altogether. “The most important thing to me is that he make it clear in the law that it only applies to aircraft that are capable of surveillance,” Carroll says. Hobbyist rigs such as his and Rochefort’s are not sufficiently steady, slow or stealthy to take sneaky shots of a sunbathing neighbor or to find an individual in a crowd, so Carroll doesn’t see privacy concerns as germane to what he is doing. Allen Gilbert, the executive director of the Vermont ACLU, joined Welch in proposing the new legislation. 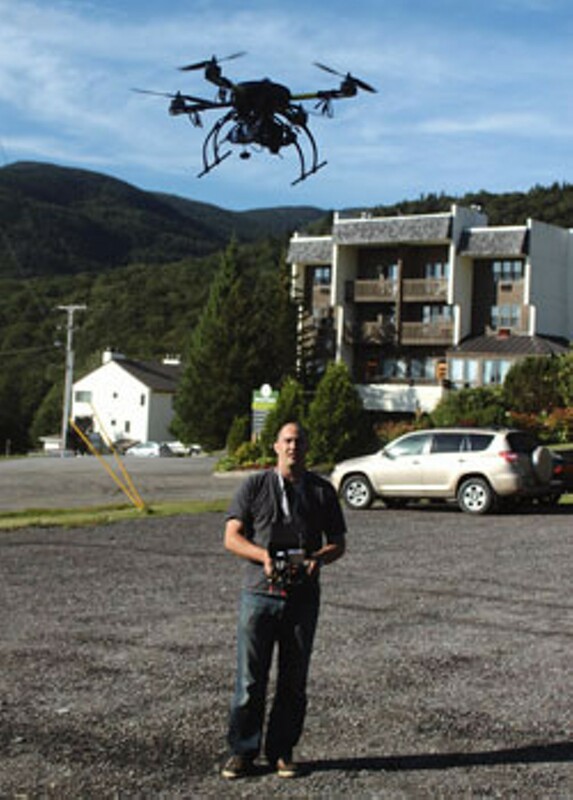 He says Vermonters will be seeing more drones in coming years with increasingly powerful surveillance capabilities. “Almost by definition, police use of drones pose a greater risk to your liberty [than use by a private company] because of how the information could be used to implicate you, correctly or incorrectly, in criminal activities,” he says. But that doesn’t mean private users are harmless. The perversion of hobbyist drones could lead to embarrassing and potentially harmful violations of privacy, too. “What’s identical in each case is the incredible surveillance capabilities these small, increasingly cheap devices have,” Gilbert notes. Rochefort, who also has a quadrocopter — a four-rotor, hovering drone that can stay in one place and oversee a small area — doesn’t see spying as viable. While the unseen, unheard spy drone is still mostly unattainable for the average consumer, the technology is constantly improving, and part of Welch’s proposed legislation is to help regulation keep up. Welch spokesman Ryan Nickel says in an email that hobbyists are “explicitly exempted from the legislation,” so they can keep on flying. Commercial users, however, such as WCAX — which owns a quadrocopter but hasn’t used it for news reporting yet — would have to provide a “data collection statement” to the FAA under Welch’s legislation. “Rep. Welch believes this is not an unreasonable requirement of drone users and is a necessary safeguard to have in place considering the powerful potential this technology has to infringe on an individual’s privacy,” Nickel adds. For higher-flying uses, such as search and rescue, wildfire monitoring, natural-disaster reconnaissance, and even air freight, the FAA must integrate drones into the National Airspace System, which is in place to make sure all aircraft over the U.S. operate safely and don’t crash into each other. Congress mandated last year that the FAA must integrate drones by late 2015, but according to its own recent report, the agency is months behind schedule. At the state level, Vermont lawmakers this year introduced legislation that could restrict drone use by law enforcement agencies — for example, limiting the devices’ facial-recognition use and implementing strict reporting requirements. That bill is expected to move forward next spring, but it is just a precautionary measure for now; no Vermont police forces are using drones yet. Back in Bolton — where Carroll and Rochefort are flying with permission from the ski area — I ask Carroll if the Zephyr has crashed into a rock. Carroll answers as if he’s just lost a golf ball in the rough and not his $1200 plane. As Rochefort jogs up the hill toward the crash site, Carroll carefully removes his goggles and puts his controller away. “So this is another adrenaline rush,” he says as we walk up the slope to discover if he’s just ruined a $200 GoPro or the structure of the wing itself. This isn’t most people’s idea of a good time, but Carroll seems to have found a detached joy in it, like betting on a racehorse. He and Rochefort look the plane over for cracks or missing pieces but don’t notice any. Carroll seems genuinely surprised, and his typical laid-back demeanor turns to excitement. The original print version of this article was headlined "Plane Sight."